Cuddalore is the fastest growing town located in the state of Cuddalore. It is believed that Cuddalore got its name from the word Koodalur, which means confluence in Tamil. Cuddalore is the place where Penniyar, Kedilam and Parvanar rivers meet. This town is developing in industrial sector and fishing industries, port related industries, chemical, pharmacological and energy industries are the major source of income in the town. Cuddalore is known for its natural beauty and beautiful beaches, and there are many alluring places which attract the tourist round the year. Cuddalore is located on the eastern part of Tamil Nadu. It is located at 11.75°N 78.45°E and at an elevation of 1m from the sea level. There is large deposit of black and alluvia soil on the land and sandstone can be seen in the town. The Penniyar, Kedilam and Parvanar rivers flow through the town. The nearest city to Cuddalore is Puducherry about 20 km away from the town, it is about 200km away from the state capital Chennai, 180 km away from Tiruchirappalli anad about 315 km away from the city of Bangalore. The rich flora and fauna can be seen in the Mangrove Forest of Pichavaram, which is located near Cuddalore. 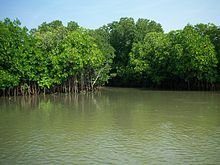 Pichavarm has number of islands having extreme water and green trees forests. There you can enjoy water sports where you may also get boats on rent. As, Pichavarm is known for Mangrove Forest, you may find the rare species of flowering plants named as Avicennia and Rhizophara. Not only the plants, but the rare species of birds also attract you in these forests. Most of the birds are migrants. About 177 species of birds have been recorded in here. You may find birds like Cormorants, Pelicans, Watersnips, Egrets, Herons, Storks and Spoonbills. The birds arrive there in the month of September to April. There is great availability of Variety of habitat for birds and animals in these forests. There is sub-tropical climate in the town of Cuddalore, thus, the temperature is much moderate here. The summer season follows in the month of April, May and June. June is the extreme hot month. The minimum temperature will be 32° and maximum 45° during summer season. The temperature is quite warm and you can feel humidity in the air. The rainy season follows in the month of July and lasts there till early October. Cuddalore faces heavy rainfall during these months and the average rainfall in Cuddalore is 1400mm. Winter in Cuddalore begins from November and continues till December and January when cool breeze blows in the town. The minimum temperature in the town during winter is 12° and maximum temperature is 27° in the winter. Temperature remains cool till the month of March. Thus, the best time to visit Cuddalore is October to March. As per the census of India 2011, the population of Cuddalore was 1,73,031, comprising 85399 males and 87632 females in the town. The average literacy rate of the town is 83.9%. The official language of the town is Tamil, but people also speak and understand English as the number of tourists visit the town.